Chris Hemsworth and Tessa Thompson are featured in the latest set photo from the Men in Black spin-off. Thompson shared the image on social media, captioning it as "Buds in Black." 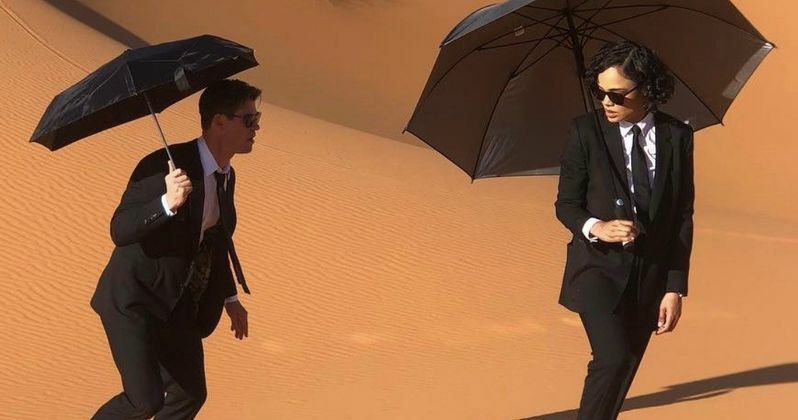 Both actors are shown in the trademark black suits in a desert landscape, holding umbrellas to survive the sun. It really doesn't look very comfortable, but this is why they get paid the big bucks to start in major Hollywood films. It's not clear if the umbrellas are in a scene or if it's during a break in between takes. Tessa Thompson and Chris Hemsworth have shared pictures from the London set before, right before they took off for Avengers 4 reshoots in Atlanta in late September. At the time, Hemsworth announced where they were going and then revealed that they were traveling to Morocco for further Men in Black filming, which is where the latest set photo was taken. While it has been confirmed that Hemsworth returned to the set pf Avengers 4, it is unknown if Thompson joined him to reprise her Thor: Ragnarok role. The Men in Black spin-off stars Chris Hemsworth and Tessa Thompson as Agents H and M, respectively. Specific details surrounding the plot are being kept under wraps for the time being, but it is widely known that the spin-off takes place within the same universe as the movies with Will Smith and Tommy Lee Jones. Emma Thompson's Agent O shows up in the spin-off, but it's not clear how she will fit into the latest installment. F. Gary Gray is directing the Men in Black spin-off and in addition to Chris Hemsworth and Tessa Thompson, the movie also stars Liam Neeson, Kumail Nanjiani, Rafe Spall and Rebecca Ferguson. It isn't clear if Will Smith and Tommy Lee Jones will be making cameos, but it has been reported that the spin-off will film scenes in New York City, which is where the characters are based out of. Even if Jones and Smith aren't involved, the spin-off looks pretty awesome from the set photos that have been released so far. However, it would be a pretty cool nod to the original movies to see Jones and Smith back in their iconic roles. The Men in Black spin-off hits theaters on June 14th, 2019, which means that the first footage of the film will more than likely be released early next year. Chris Hemsworth, and possibly Tessa Thompson, will show up in Avengers 4 about a month before, meaning that Hemsworth is going to dominate the 2019 summer box office with two highly anticipated projects, much like Josh Brolin did this past summer with Infinity War, Deadpool 2, and Sicario 2. While we wait for some more information on the Men in Black spin-off, you can check out the latest set photo below, thanks to Tessa Thompson's Instagram account.